A fabulous new photo was acquired yesterday by Marco Langbroek, an amateur astro-photographer living in Leiden, NL. 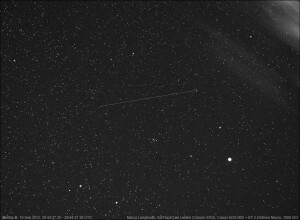 Marco’s done some excellent work in the past couple years, capturing images of ATV, Envisat and Phobos-Grunt. Now? It’s Metop-B! Thanks, Marco, for sharing! 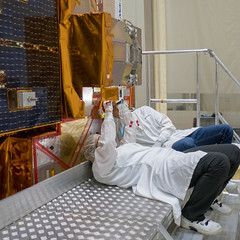 MetOp-B satellite launched on September 17th. In the picture, it is passing through Lyra (brightest star is Vega). stage from the Kosmos 1410 launch in 1982. The streaks in the upper right corner are clouds. 20:44:27 UTC. 10-second exposure with a Canon EOS 60D + EF 2.5/50mm Macro lens, 1000 ISO.